Jeannie Baker’s children’s picture-book, Where the Forest Meets the Sea, tells the story of a young boy’s imaginative engagement with the rainforest. Like the book as a whole, the image, captioned ‘I pretend it is a hundred million years ago’, depicts the rainforest as a place of primeval wonder. 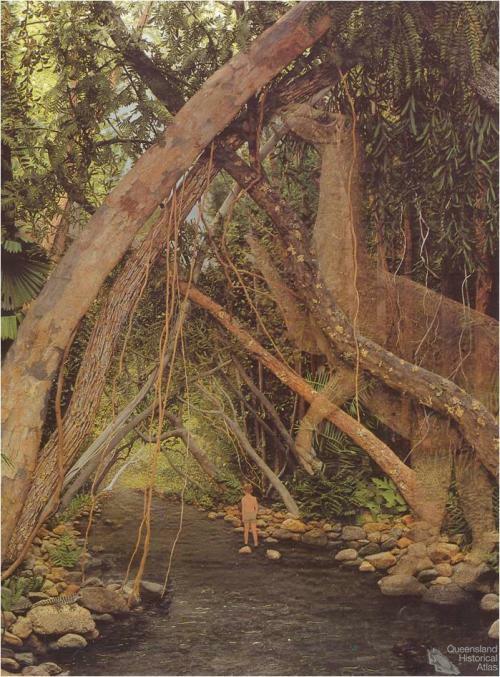 Baker’s images are based on the rainforests of the Daintree-Bloomfield region, which had inspired massive protests against rainforest destruction only a few years before her book was published.